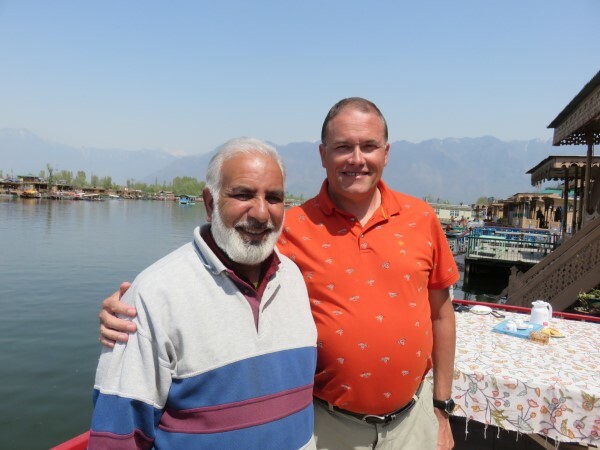 David from Ireland is one of the legends of the travel community and we are very pleased to host him today in this interview so you discover the incredible feat he is about to achieve! David, tell us something about your background, your work, and how you got interested in travelling. I have lived in Dublin all my life. Growing up, I had a happy childhood. My parents did travel quite a lot in Europe before I was born, I can see from the old photos. In my early teenage years they went to the States quite a bit and my holidays were to Spain in the late 1960s. That was my first taste of travel. My family were all in the Furniture business so at 15, I left school and joined one of the businesses. At this early stage, I was a stamp collector and was very familiar with the stamp issuing countries in the world. I loved geography. So my spare money went on stamps . During my first year at work I decided I wanted to travel. I had started to collect the stamps of Tuvalu since you could start at the beginning as they only gained independence from the UK on Oct 1 1978. So after a few years saving up, my first trip was to the Pacific for 5 weeks visiting Hawaii, Fiji, Tuvalu, Kiribati and Nauru. Mostly to do with the plane schedules In Tuvalu I spent one week as then there was only a flight once a week. 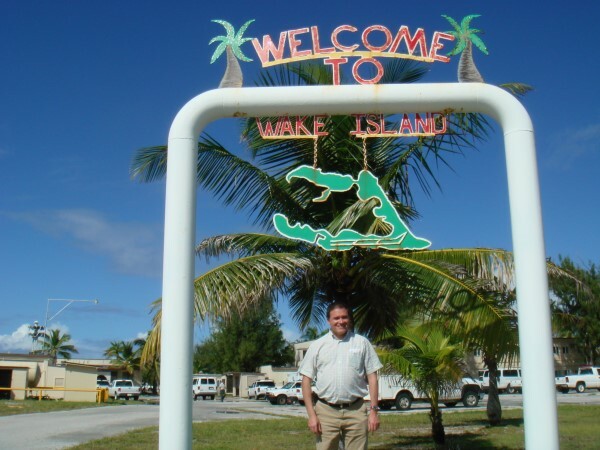 In Nauru I spent 3 days, but they were very wealthy then with phosphate. That was a great trip in 1980 and I learned so much from talking to people and seeing the world. It was the start of my University-of-life education. I went back to visit more Pacific Islands in 1983. But after that I stopped travelling for some time as I was too busy with work. Furniture trends were changing in the late 1980s and so I was starting to buy more from the Asia and China. So I was spending quite a bit of time out there, selecting and designing furniture for Ireland and the UK. I was involved in badminton so that took up all my spare time. So my life was work, badminton and friends. I was also a International umpire and was doing some travel to mostly Eastern Europe for that. It was about 2001 again when I started to travel again more for enjoyment. But it was hit and miss. My own business had grown to one of the largest furniture businesses in Ireland so I was now able to travel a bit more as my passion changed from badminton to travel. In 2002 I discovered the Travel Century Club. At this time I had been to over 80 on that list . So that is how all that started. You are very close to finishing all countries in the world. What have the greatest challenges been, and what the greatest rewards? I guess managing work and travel. In 2004 I made a plan to visit every TCC country/Territory and I worked out with work it would take about 15 years. In each country I visit I try to see the highlights at the least. So jumping across borders does not work for me on that score. Most of my challenges relates to planning on trips by Expedition ship. I have never taken a private charter and so as I plan so far in advance I try to work out the best time of the year to visit anywhere. Ship-wise I have to plan and hopefully subject to weather get to all the Islands I want to visit. I have been very fortunate to visit all the Atlantic islands (Bouvet, Tristan, St .Helena, Ascension) and Pitcairn which needs luck for sure. I have had no issue visiting any country and was fortunate to visit Libya, Syria and Yemen before the areas became conflict zones. I am now just about to visit Tokelau, the ship should be leaving in a couple of days. The last time I went to Samoa the ship left early so I missed the boat. Fingers crossed at it my last territory to visit that has no airport. For me meeting people is the biggest joy. As anyone knows who has met me I am a people person . I love to meet people from different cultures and learn and laugh. It is as simple as that. 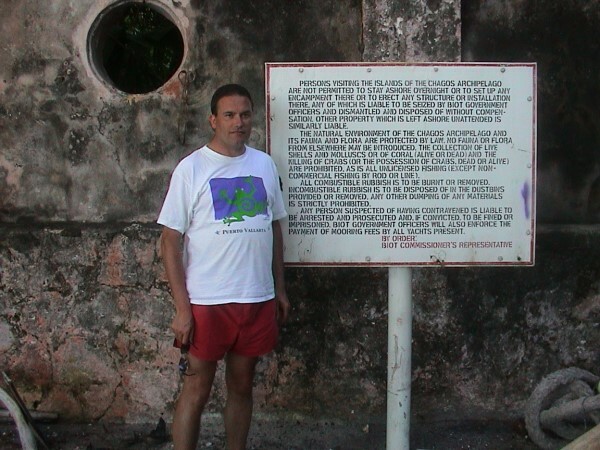 Though a lot of the time it is me who is making the jokes..
British Indian Ocean Territory (BIOT), 2005. Of the countries you have been to, which ones have surprised you positively or negatively? Well I have a love of Iran. I first visited in 2001 when Ireland were playing a World Cup qualifier in Tehran. In those days the players and the fans went on the same plane. It was a great 3 days and we qualified for the football world cup. The people were so friendly and so much to see. I have been back 3 times since and I am best friends with my original taxi driver and his family. I do enjoy many countries in the Middle East and Syria was such a wonderful destination when I visited in 2008. In the Pacific I loved the Marquesas Islands (French Polynesia) and the Aitutaki lagoon in the Cook Islands. I have a love of Islands and these two are beautiful in many ways. I especially like the Caucuses Georgia and Armenia spring to mind. The mountain scenery is amazing. 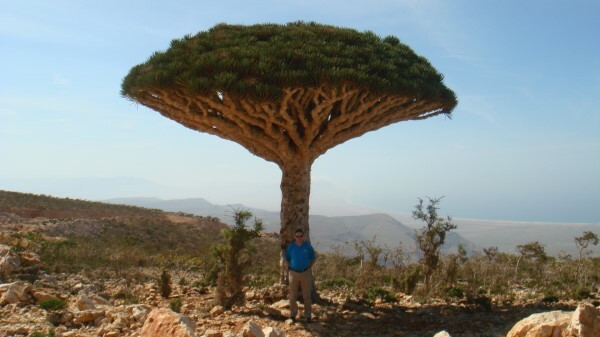 Algeria, Eritrea, Sao Tome and South Africa are stand out destinations for me in Africa. Finally, Europe has so much to offer. I still have more to discover despite being to every country. Spain and Italy are my favourites. You have a very unique interest involving stamps and posting cards from every country you visit. Please explain this to us in detail. I have been a stamp collector since the early 1970s. Specialist collections were British Commonwealth, Ireland , Russia and China . So I have always had a love of stamps. On my trips I would send postcards to friends and always said to myself I wish I got a postcard from some of the places myself. The Postcard thing stated in 2004. I was visiting Turkey and went across to the Asia side. I was trying to think of a way to show I had been there. While walking around I discovered a postcard showing this side of Istanbul. So I posted the card. My next trip as it happens was to North Korea and I sent a postcard back to myself from there. So that developed into sending back a card back to myself on each trip. Since TCC is the list that mirrors Postal Authorities the most, that is the appeal for me. So I want to have a card from every Postal Authority in the world. Sent by to me to me from the country. So I just love going to Post offices buying unusual stamps .I have stamps made with Glass from Austria, Volcanic Ash from Iceland and linen from Italy. Finding Postcards are not always easy so sometimes I buy cards on the internet in advance and bring with me. 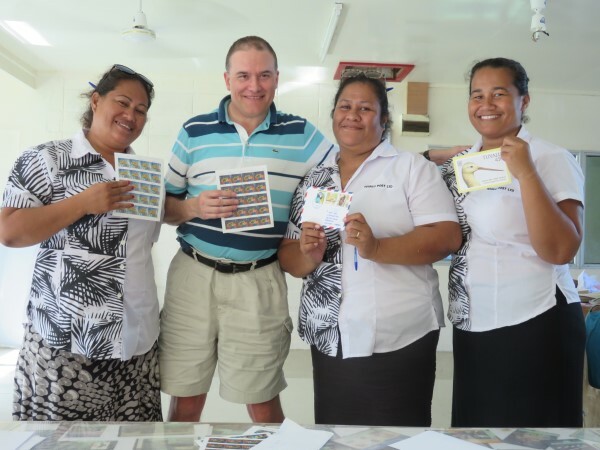 David at the Tuvalu post-office on his latest visit to send the postcard! So which post-offices were the friendliest and easiest, and which ones were the most complex and frustrating? I have had so much fun at the post offices. Many times I am brought into the back office to meet the Postmaster and take photos. The most beautiful Post offices I think are Ho Chi Minh City, Algiers, Santiago de Chile and Dublin. The friendliest have been varied.. The ones that stand out are South Ossetia. I was so pleased as they issue their own stamps. Everyone in the Post office came to a stand still when I told them how wonderful they all were. Post office staff are not used to getting compliments and gifts.. So smiles all around. 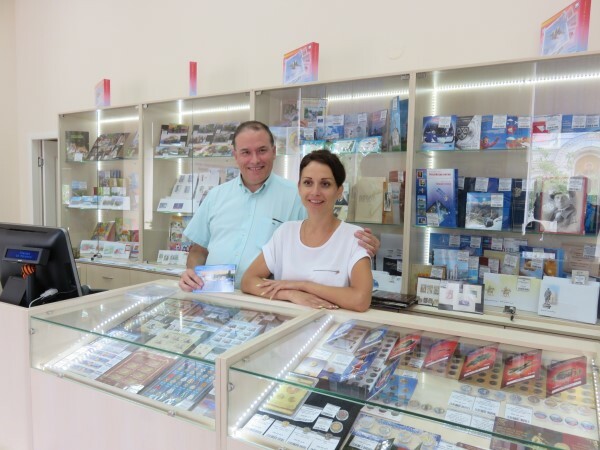 The best display Post Office goes to Sevastopol Crimea (Russia) . Brand spanking new with beautiful glass counters and a place to have coffee. 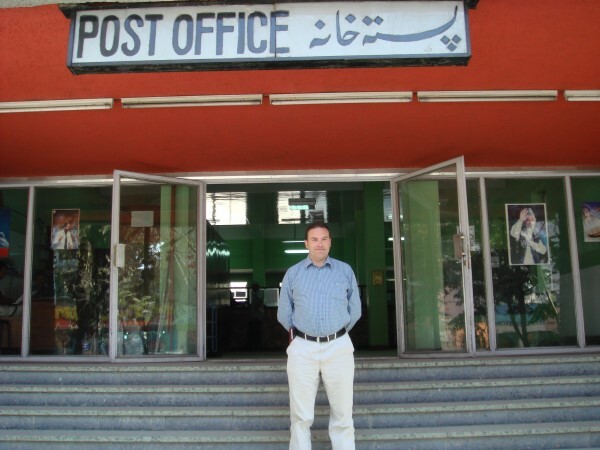 This is a philatelic office which is next door to the main Post office. In Abkhazia you have to add Russian and Abkhazia stamps as these stamps are only for local use. On my recent trip to Panama, the main Post office had no stamp.. Luckily I was visiting other Post offices which had stamps. Japan is always a joy to visit. The staff there won't let me take photos of themselves but they are very polite. On one occasion the lady ran out out from behind the counter when I asked to take her photo. In Baghdad main Post office I had to use the light on my phone to see as there was a siren going and all the electricity went off when I was in the building. Sometimes trying to get guides to bring you to a Post office is hard, as they tell me that they will mail the card for me. I always mail my own cards. There are currently no operating Post Offices in Somalia and South Sudan. Guatemala is just about to start up again. I guess I am a bit of a nerd with Post offices. When I travel with friends they know that part of the deal is that we visit Post offices. They always groan about this but yet they do come in with me to see what is likely to happen . In Shanghai, I had to get them to understand that I wanted stamps for Airmail. So I had the customers pretending to be planes as we flew around the office , it was so much fun! Sevastopol, Crimea Post Office philatelic shop in 2016. You have a few more places to do in order to finish both the UN list and the TCC list, and that would also be the end of your 'postage' list. So, what happens after that in terms of travel? After the TCC List I have a few odd ones to finish. Japan issues stamps for every one of its 47 prefectures . I have visited 8 at this time. Those are the largest ones. So the smaller ones and easier to get to will take a few years to do. I will also visit Eastern Ukraine as they have issued stamps for local use. My most difficult one will be Niuafoou which is in the Northern Tonga Islands. The flight goes once a month. So it is a ship and plane combination. I was booked on the plane a few years ago, but when I went to the airport I discovered there was no flight and there had not been for 4 months! So now I will proceed with caution on that one. I have made a new plan visiting places I want to see more of. At this time that includes - Algeria, Norway, Israel and Greece. So I will still travel but not as much and spend more time in each country. You have met a great number of 'big' travellers from your trips. As an eager student of human nature, what do you feel links all these people in terms of character, and what sets them apart? Have any of these travellers made a marked impression? The first "big" traveller I met was Christine Kloner from New York. 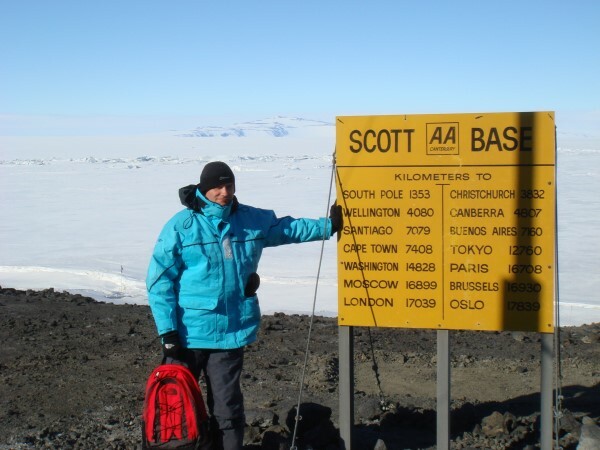 I meet Christine on the original Bouvet South Atlantic Trip. Christine has about 4 to go on the TCC list. Christine has become a good friend. What I remember was sitting down at that early part of my Country Collecting with Christine and we would discuss every country and territory. Christine could remember so much going back over the years from what to see, to where to stay, it was an amazing introduction to places at that time I had yet to visit. I also met Charles Vealey on the trip to Rockall. He was Mr Charming and so relaxed, I enjoyed hearing of his adventures. Charles was one of the first country collectors I had ever heard of online. They all have determination but yet fun to be with. They enjoy the travel as much as getting to new places. That is key.. Not just about getting to somewhere but to enjoy the experience. I have to also mention Karen Sinniger.. Karin has dived in more countries then anyone in the world. We have travelled together a few times..
You're from Ireland. How do you feel your origin may have affected the way you look at the world? And how do people react when they find out you're Irish? For a start we are an Island nation. So always looking to the world. At School, Geography and History were important subjects and certainly gave me that curiosity about the world past and present. Also during the 1970, 80s with "troubles " in Northern Ireland it was always news when I travelled. Although living in Dublin which at that time was about 3 hours from Belfast we were not effected by what was going on across the border. It might have been a million miles away. So when I was going to areas of conflict I would always look to see in the country where it was considered dangerous and not paint the whole country with the same brush. When people find out I am from Ireland I am usually asked North or South. I usually say I am from the Middle which is true. I have a very Dublin accent so some people will recognise that. They expect me to be drinking pints of Guinness, which I don't . As a rule of thumb, the Irish are loved where we go as we enjoy " The Craic" (Laughter, Chat and enjoyment). We are not one of the big powers so to speak. So I get very positive feedback about Ireland and how progressive we are considered to be. Well to start off with I would like Captain James Cook. I have read a few books about him and love the joy of discovery and even today some of his measurements on sea charts are still use. The Queen,, What an amazing woman. She has seen so much and when The Queen visited Dublin for the first time she was a revelation. We could chat and share stories about the Commonwealth and I would love to hear all about the wonderful people she has met. Nelson Mandela. A Statesman in the true nature of the word. This man gave so much to the world. An inspiration. Mary Robinson, the first lady President of Ireland. Did so much for minority rights in Ireland and changed the nature of our presidency. I did in fact sit beside her at dinner once but not at the same table.. So now I could put that right. The photos in this interview are from David's personal collection and we thank him for sharing them with us at NomadMania!